Hi Everyone, Nicky from Kitchen Sanctuary here! 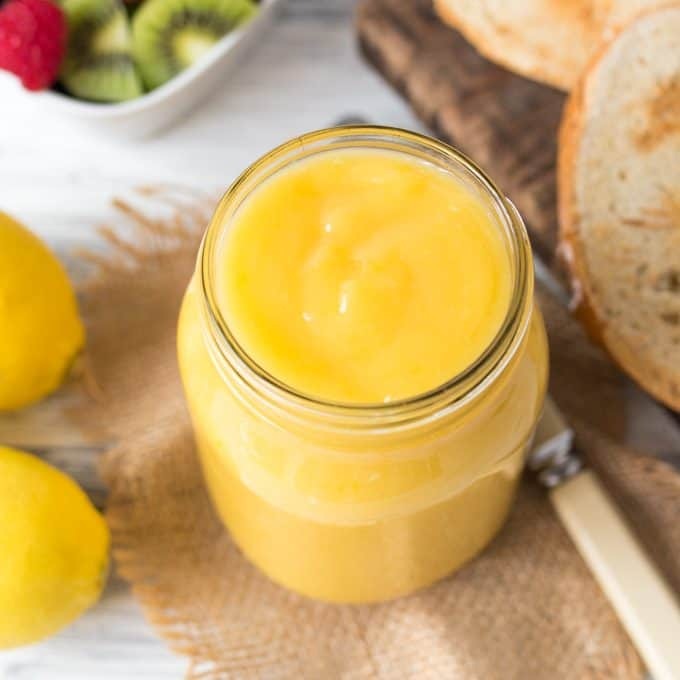 Today I’m sharing a recipe for delicious creamy-yet-zingy lemon curd. I love lemon curd and I’m always on the lookout for it (and other fruit curd flavors) whenever I visit a farmer’s market. The sweet and tart taste is just a wonderful way to wake up your taste buds in the morning. As well as making an excellent topping for toast, I like to use it in cake fillings, on pancakes (mixed with a little mascarpone) and in desserts – such as this strawberry & lemon fool. It’s relatively simple to make, and a jar of it will keep in the fridge for 2-3 weeks. My kids are going crazy for this stuff at the moment. 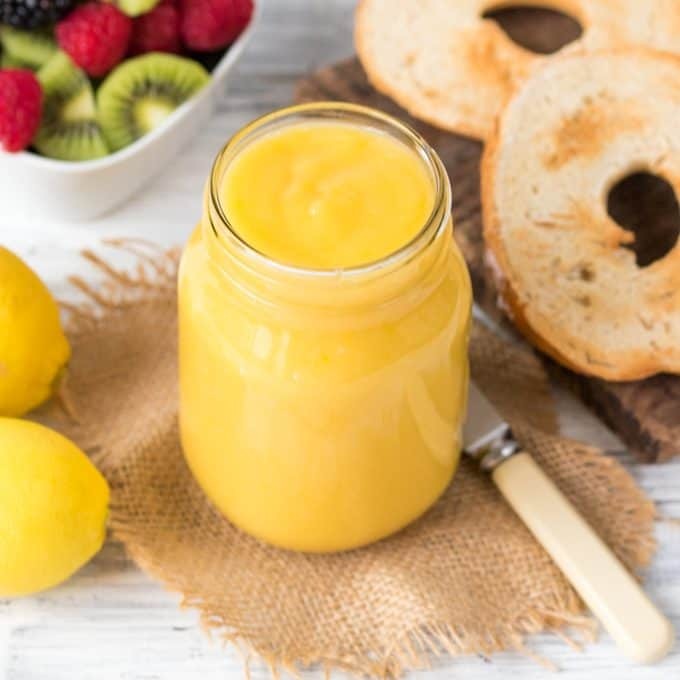 As soon as they get in from school, half a bagel or a couple of crackers with a dollop of lemon curd is the first thing requested when they walk through the door! Hope you enjoy it, and I’d love to hear if you’ve tried any unusual or interesting fruit curd flavors. A sweet and tart way to wake up your tastebuds in the morning! You’ll love this creamy, zingy summer treat. Set up a double boiler – or use a bowl set over a pan of simmering water (make sure the bowl isn’t touching the water though) and place the lemon zest and juice, sugar and the butter into the bowl. Heat on a medium heat, stirring every few seconds until the butter melts and sugar dissolves. Just heat until it’s at this point – you don’t want to boil the mixture. Mix together the eggs and egg yolk, then pour into the lemon mixture (still on the double boiler) whilst stirring with a whisk. Continue to heat on a medium heat, stirring every few seconds with a whisk until the mixture thickens enough to coat the back of a spoon. This should take 5-8 minutes. Once thickened, remove the bowl and leave to cool. Give it a stir every 5-10 minutes until the mixture is cool, then place into a sterilized jar. Screw on the lid and refrigerate until needed (or serve immediately!). 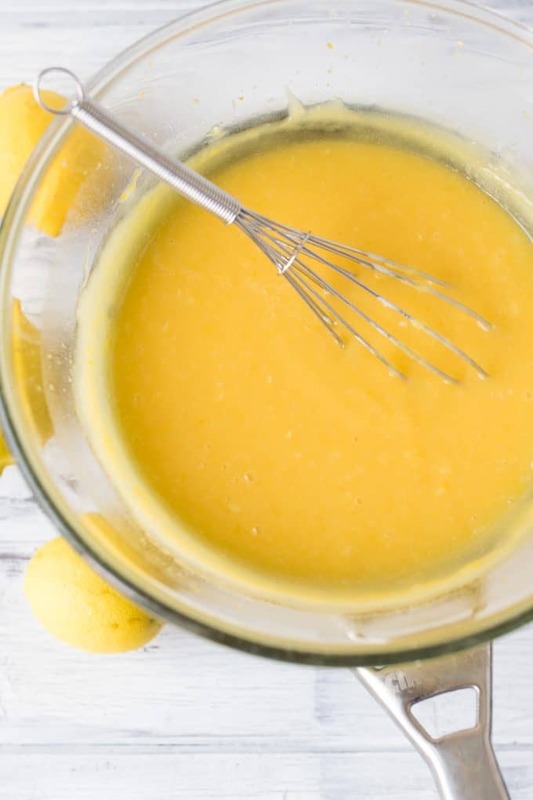 You may occasionally find that you get a few white lumps in your thickened lemon curd – this is due to the egg whites cooking at a slightly different temperate to the egg yolks. I usually leave them in there, but you can strain the lemon curd over a fine mesh sieve to remove if you prefer. 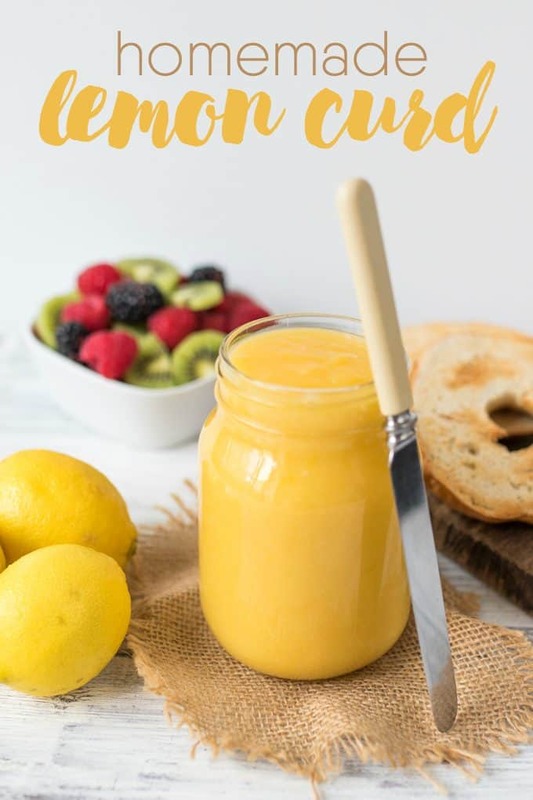 I’ve never made a lemon curd…..something different that’s for sure! I’ve never tried lemon curd before. Sounds delicious! 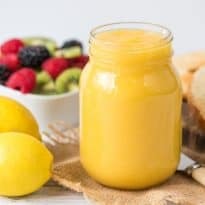 This looks very delicious, I would like to try lemon curd some day. Wow it is eye popping beautiful and sure looks good. It is so yellow I wonder it must be the extra egg yolk. I’d love to try this! I’ve never tried lemon curd before. Your recipe sounds easy and looks delicious, thanks! I would take issue with one sentence: a jar of it will keep in the fridge for 2-3 weeks. Wouldn’t have a chance to last that long at my house. YUM! OMGosh, looks so easy and delicious! I would use this for some of my deserts! I have never had lemon curd. This makes me want to try it. Looks easy enough to make, will have to give it a try. I love lemon curd but have never made it. Easy recipe to follow. Thanks. Yum! This looks like a great summer treat recipe. Thanks for sharing it. Oh yum! And it seems so simple to do. I wonder how it would turn out if I made a bit more and canned small jars of it to add to christmas presents this year. This sounds so good, I love lemon too! Lemon Meringue Pie.. and just about everything lemon. 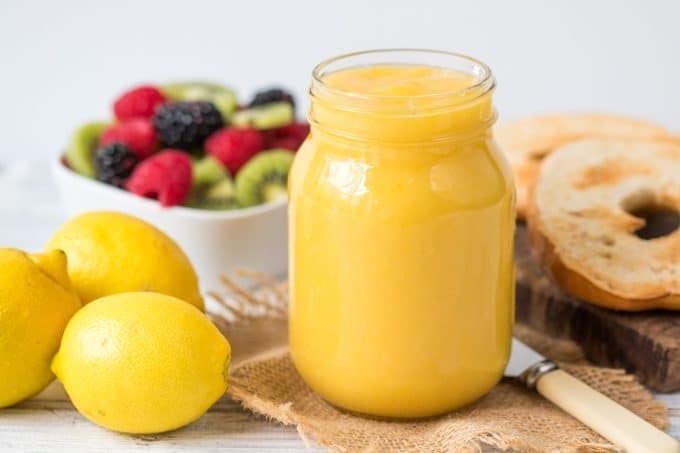 I have never had lemon curd and it sounds and looks wonderful. I am definitely going to give this recipe a try. I can’t wait to try it on my English muffins. Wow this looks good. I’ve never thought of making my own but it seems simple enough. Oh my…my teen would love this! She loves all things lemon!!! My stepdad was from England and he loved Lemon Curd on his toast every day! We would go and buy it at an English Import Store each week. I wish he was here for me to make it for him, this looks so good! This sounds so good. It actually made my mouth water. My mom made it years ago, but I never knew how to make it. Thanks for sharing. This looks AMAZING! My mouth is salivating at the thought of some zesty lemon. YUM! I love, love, love lemon curd. My grandmother made a delicious version very similar to yours. You have inspired me to make some! This is something I have always wanted to try and make. Yours looks delicious. So glad I saw the link on Totally Terrific Tuesday. I can almost taste this delicious Lemon Curd. I really appreciate you sharing with us at Full Plate Thursday and hope you have a great weekend! I was just looking for a lemon curd recipe a few days ago! This one looks great. I wouldn’t want it on a bagel, but I was thinking of using it as a macaron filling! I came by from the Be Inspired party! OMG looks SOOOOO amazing! thanks so much for sharing at Merry Monday! It looks and sounds easy enough. Love lemon!